Boids is a draft programming task. It is not yet considered ready to be promoted as a complete task, for reasons that should be found in its talk page. 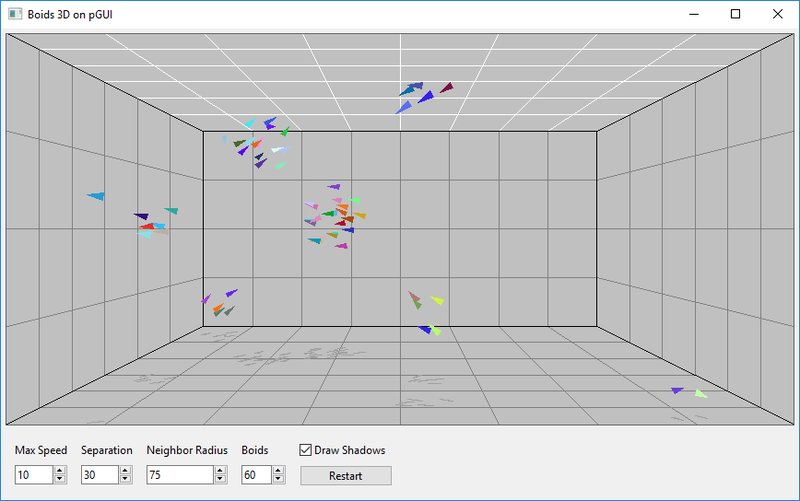 A Boids algorithm simulates the flocking behavior of birds. This task requires the creation of a graphical or purely textual simulation of a flock of birds navigating the cave with obstacles depicted below. If you implement a purely textual simulation, this is a possible board representation, where "O" are the boids that should go toward the right, "#" are fixed walls that should be avoided by the boids, and "." is free space (using a space is also acceptable for free space, if you add some kind of frame around the board). A simulation that doesn't contain obstacles but only shows flocking behavior is acceptable. This page was last modified on 7 June 2017, at 10:33.